Drawing is something this creative 15-year-old could do all day. Dayjah -- who’s in foster care -- is hoping her future adoptive family will appreciate art as well. She describes herself as having a good sense of humor. “I’m funny and smart. I make everybody else laugh around me,” she said smiling. Her favorite subjects in school are social studies and math. When she grows up, Dayjah would like to be a pediatrician. But her main dream is having a forever family. “[I want] a family that actually wants me in their home and takes me as their own kid,” she explained. Dayjah has a strong relationship with her siblings. She’d like a future family who is open to letting her stay in contact with them. “I’d like to see my brothers and sisters more often,” she explained. She dreams of having a Mom and a Dad share experiences with her. “Adoption means to me [doing] what normal families do. Go out, watch movies, go shopping… go to my basketball game and cheer me on,” said Dayjah. “I just want a forever home,” she said softly. If you’d like to learn more about Dayjah, click here. 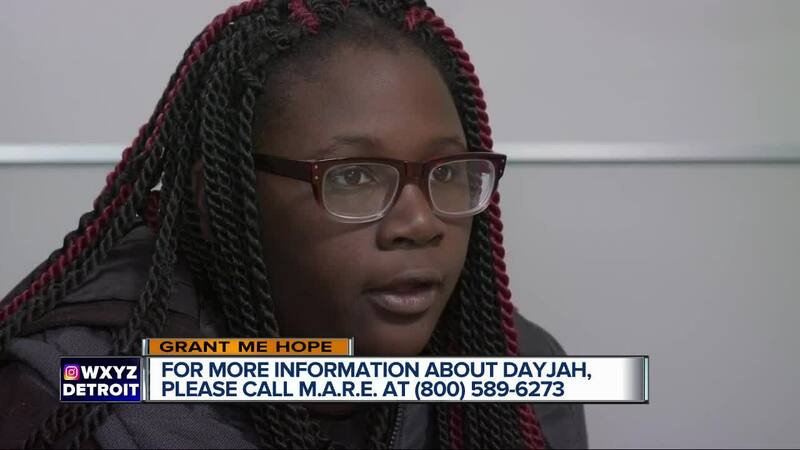 You can also find out more about fostering or adopting Dayjah by calling the Michigan Adoption Resource Exchange at (800)589-6273. If adoption is not an option for you, you can still help. Please share this Grant Me Hope video on social media to spread Dayjah’s story and help her realize her adoption dreams. Thank you!